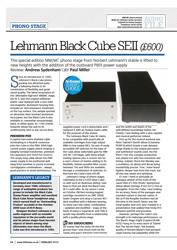 Virtually all common systems from high-output MM to MC may be connected to the Black Cube SE II. We have included a free slot per channel for the solder-free fitting of a custom impedance, and there is also an extra hardwired plug-in location with immediate action. Should you wish some resistors to match your personal system to the Black Cube SE II, we will enclose them with your order at no cost. "To ﬁnd more depth and detail in music I know so well was a remarkable experience and I warmed to this little gem of a phono stage all over again." The high-precision passive RIAA filter network sits between two linear gain stages and has been realised using high-grade, surge-proof and narrow tolerated polypropylene foil capacitors. That way transients, dynamics and timbres can reach the listener in a pure manner. As with the whole Black Cube family, the Black Cube SE II also uses professional input stages of the latest generation for a precise, low-noise and powerful reproduction. The audio section contains additional modules for an efficient hum, HF and random voltage suppression. The use of a double-sided audio board allows an optimised trace layout for a particularly low-interference operation. By the way, with its high-class front panel (silver, black or chrome-plated) the Black Cube SE II also cuts a fine figure in your hifi rack. "The upper end of reason class!" "This is a true audiophile phono stage and, partnered with equipment of equal quality, the results are remarkable. Indeed, the SE II is diffi cult to fault even compared to competition in a much higher price bracket. The exceptionally low background noise allied to a fabulous rhythmic and tonal rendition make it worthy of consideration for those seeking the most detail from their vinyl without having to make a hyperspace price jump."